Pompey are reportedly chasing Queens Park Rangers forward Paul Smyth. 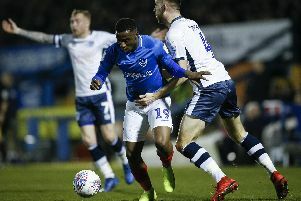 According to westlondonsport.com, Kenny Jackett is keen to bring the 20-year-old to Fratton Park on loan before the transfer window shuts a week today. The Belfast-born talent started his career at Northern Ireland Football League Premiership outfit Linfield, scoring 15 times in 65 appearances. Smyth moved to Loftus Road last campaign and registered two goals in 14 matches – including the winner on his debut in a 2-1 victory over Cardiff on New Year’s Day. His impressive performances saw him clinch the club’s young player of the season award. Smyth also earned himself a call-up to Northern Ireland’s senior squad. The youngster won his first cap against South Korea in March and bagged an 86th-minute match-winner in the 2-1 victory at Windsor Park. The attacker has featured twice for Steve McClaren’s QPR in the Championship this term. Pompey have already signed David Wheeler on a season-long loan from the Hoops this summer.